Looking for a little ROMANCE FOR LOVERS for VALENTINE or Anytime? 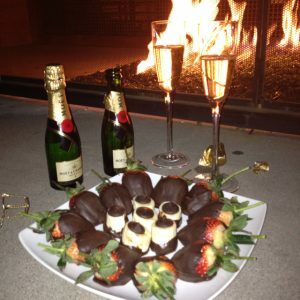 Nothing says Romance like a little chocolate, some champagne (drink of choice) and LOVERS MASSAGE done with an oil to bring out the sensuality of the moment. Valentine’s Day, the centuries-old observance honoring love, has long been celebrated with chocolate. Think Chocolate dipped strawberries, that you can have in the tub, feed to each other, easy to prepare or can be purchase anywhere. It is fact that chocolate, that wonderful decadent flavor, gets right to the heart of sexual pleasure by increasing the brain’s level of serotonin. And the tiny bubbles in a glass of Champagne that chilled, acidic, sparkling drink, makes you feel all warm and fuzzy inside. However, make note that if you want to pair bubbles with chocolate and want the wine to taste good…choose a sparkling wine with some sweetness or some pink or red color…to enhance the flavor or the 2 sweets! Below are several options, for your desserts. A salted truffle ball which would offset a drier champagne. And let’s not forget the massage and possible a nice bath. Nice additives for the bath are a few drops of Rose oil and/or Rose geranium. And of course the oil!! A floral, earthen, exotic, and sweet blend that appeals to male and female. Drop all essential oils into a glass bottle, add Jojoba oil, and roll bottle between palms to blend oils. Decorate with a ribbon and pretty label if desired. Shake well before each use. Perfect for VALENTINES and don’t forget the candles. And of course, may be used throughout the year!!!!!! Remember, Romance is not just for Valentine!!!!! Heat dark chocolates and condensed milk in a double boiler over medium low heat until chocolate is melted. Stir—mixture will have a slight marshmallow texture. Stir in vanilla. Remove from heat, cover and refrigerate for two hours. Once chilled, roll in balls, then roll in melted milk chocolate coating. Sprinkle with sea salt or other fine, coarse sprinkles. chocolate, lovers oil, massage oil, romance, seasalt truffles, valentine. Bookmark.